Who knows what risk small consumer-flown drones pose to manned aircraft? Formally, they’re meant to be called unmanned aircraft systems but the gravitas of that title hardly seems suitable for the most common category of unmanned aircraft—store-bought, amateur-flown toy aircraft, mostly multi-rotor electric helicopters. Let’s stick with drones. How dangerous are these drones to manned aircraft? The truth is no-one knows, and, quite rightly, no-one is prepared to find out the hard way. At the time of writing, nobody has been killed in a collision between a civilian drone, of any size, and a manned aircraft. Long may that continue, but the risk, while chillingly imaginable, cannot be quantified. National aviation regulators, industry bodies and pressure groups around the world are attempting to determine whether the issue of drones and aircraft coming together is a big, small, or medium-sized issue. With no fatal accidents to draw conclusions from, simulation, speculation, extrapolation, and, occasionally, misrepresentation are rife. Some studies play up the threat of drones to manned aircraft while others play it down. For most of these arguments the starting point is bird strikes. Bird strikes are, literally, an everyday occurrence. Between 1990 and 2013 there were 59,822 recorded in the US where the aircraft was at 500 ft or lower. In 2014, 444 bird and other animal collisions with aircraft caused $US951 million of damage, although no human deaths. This is greater than the number of manned aircraft-drone sightings collated by researchers at The Centre for the Study of the Drone at Bard College, in New York State, US. Over a 22-month period from December 2013 to September 2015, the study recorded 158 incidents in which a drone came within 60 metres or less of a manned aircraft. There were 51 incidents in which the proximity was 15 or fewer metres and 28 incidents in which a pilot manoeuvred to avoid a collision with a drone. There were 116 close encounters involving multi-engine jet aircraft, 90 of which were commercial aircraft. There were 38 close encounter incidents involving helicopters. The Bard authors found over 90 per cent of the incidents occurred above 400 feet, the maximum altitude at which drones are allowed to fly. 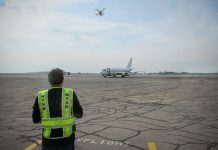 A majority of the total incidents occurred within five miles of an airport (which is also prohibited airspace for all drones, regardless of the altitude at which they are flying). Incidents within five miles of airports occurred at lower altitudes than incidents beyond five miles of an airport. There are questions as to the verifiability of many of these sightings. Airline pilot and aviation blogger, Chris Manno, says drone sightings are over reported in the media. ‘By sheer numbers alone, bird conflicts and even bird strikes dwarf the number of drone “sightings” by airliners, but they’re simply no longer news,’ he writes. Putting the question of the likelihood of a collision aside, there is increasing debate as to the potential damage caused by a drone impact. Again, the starting point for many of these arguments has been bird strikes. A paper produced by Texas Aviation consultants, Aero Kinetics, argues that drone and bird strikes are potentially very different, with drone and aircraft collisions being more dangerous. ‘A bird consists of organic material, is generally lightweight, and is mostly fluids, whereas a toy drone consists of metals, plastics, carbon fibers, and is generally more solid and structurally rigid than a bird,’ the authors, W. Hulsey Smith and Freddie Main III, write. A computer simulated engineering study by Virginia Tech University in the US attempted to determine the damage a drone would do to a large jet engine. It found that a 3.5 kg quadcopter drone would rip apart the fan blades off a three-metre diameter turbofan engine during take-off in less than 1/200th of a second. Drone debris inside the engine would reach speeds of 1150km/h, the simulation found. A head-on rotorcraft drone strike will cause the catastrophic failure of the rotorcraft’s windshield, resulting in significant damage to the aircraft and most likely injury to the pilot. The damage and injury qualitatively show to be non-survivable based upon the kinetic energy of the impact. A head-on drone strike into the windshield of a commercial airliner on approach or departure is most likely survivable based upon the kinetic energy of the impact, but would result in damage to the aircraft and economic losses. A head-on drone strike into the inlet of a turbine engine on a commercial airliner on approach or departure would cause severe damage to the engine, and potentially a catastrophic failure, in either case resulting in damage to the aircraft and economic loss. Others are less convinced of a clear and present danger. Eli Duorado, an economist and technologist at the libertarian Mercatus Center, used data from the US Federal Aviation Administration’s database of wildlife strikes to show that there had been more aircraft collisions with turtles than drones. Since 1990, the FAA has recorded 198 aeroplane-and-turtle collisions, and no drone-and-aeroplane collisions. Turtle collisions, it need hardly be clarified, are by definition ground-based. ‘If we’ve hit turtles 198 times and drones zero times, then maybe we are worrying too much about collisions with drones,’ the youthful libertarian told US Popular Science, tongue firmly in cheek, and blithely ignoring the fact that widespread civilian use of drones only really took off in the last five years. However, Duorado concedes there is a potential safety issue with drones and aircraft. ‘The larger drones that could get sucked into an engine and cause a plane to crash … that is something that concerns me,’ Dourado told US broadcaster C-Span in November. Manno says an aircraft he was flying hit a 4.5kg duck on the windscreen but suffered no damage and no ill effects, apart from the fact that ‘the crew meal en route was less appetizing with the backdrop of frozen duck guts. 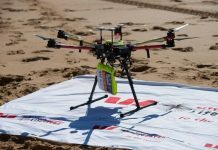 Dr Reece Clothier, deputy director of the Sir Lawrence Wackett Aerospace Research Centre at RMIT University and president of the Australian Association for Unmanned Systems says all elements of risk have to be considered. There are various elements to this risk equation, two of which are the likelihood of a collision between a manned and unmanned aircraft, and the potential damage caused by a drone strike. ‘Existing studies tend to address just one component of the risk equation’ he says. If you look at bird strikes in Australia over the past 10 years the ATSB has recorded more than 14,500 strikes. Most of those were classified as low to medium risk events. They happen on a daily basis. ‘With unmanned aircraft there is the exposure question of where you’re most likely to encounter unmanned systems. A pilot is most likely to encounter a drone at low altitude, on approach or take-off from an airport, or over a population centre. Even though the potential impact damage caused by an unmanned aircraft could be higher, compared to a bird, the studies say nothing about the net risk to manned aviation. And while he sees the risk of drones totally disabling an airliner as small, he says the risk to helicopters is greater, because of their design and exposure. ‘Remember that when Sullenberger and Skiles landed in the Hudson in 2009, it was a after a multiple bird strike. To get a dual engine-out scenario from a drone strike you would need to encounter multiple unmanned systems. 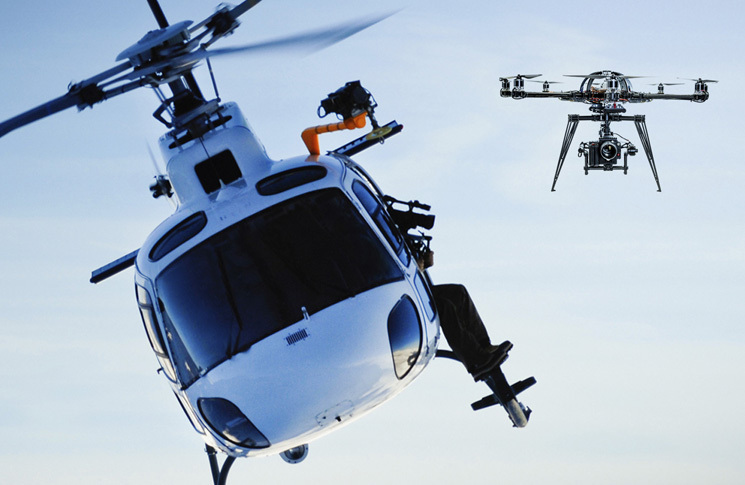 ‘Rotorcraft operating at low altitudes are more likely to encounter drones. They are also more susceptible as they have lower bird strike protection requirements than commercial fixed-wing aircraft. In particular, windshield strike or a strike causing a tail rotor failure. Finally, Clothier says, drone strike is only one part of the safety issue. A very interesting article. Potentially I am an operator of a drone because I have 2 on order. However I would NEVER operate them near an aerodrome of any kind because I am also a PPL holder and I have no desire what-so-ever for my flying to be threatened nor to threaten anyone else’s flying. My reason for buying the drones is for very low level photography over difficult terrain, like river valleys, waterfalls and so on. The idea that anyone would ever fly a drone over or near an airport, as has happened, is quite scary. It should be compulsary to fly any rc aircraft at a proper model aircraft site NO EXCUSES , It would be in the best interest of the pilot who is making holes in the sky , not an unmanned fool . 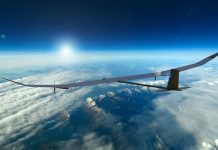 Shared in http://www.adronepilot.com, we join unmanned and manned pilots to avoid this hazard. @doug, I bought my drone as a flying camera. Being restricted to Rc clubs and parks would defeat it’s purpose, which is to find unique and stunning film shots. I have my ‘can I fly there’ app and I know I have flight restrictions. So I respect those legal requirements while still looking for those great scenes. You’re suggestion is good for training and familiarization, but flying cameras need a broader canvas.